That is quite the title, right? Well, it is quite the pattern, so a fitting name. 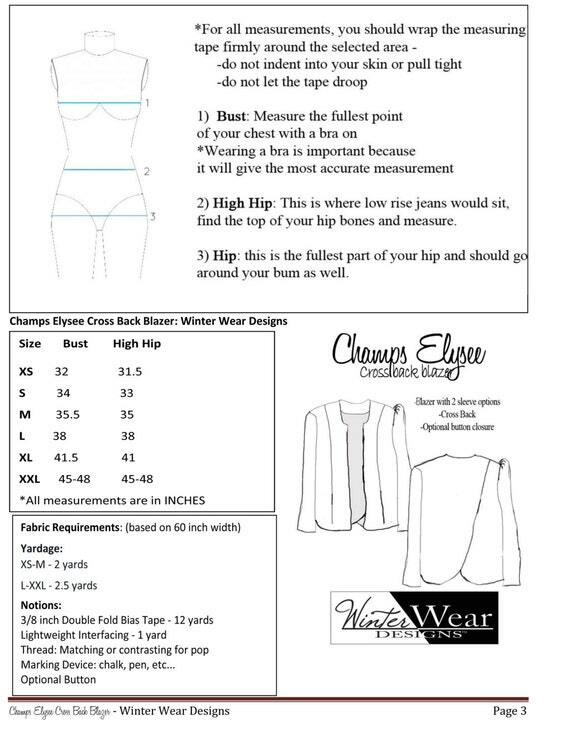 I loved making the Winter Wear Designs Champs Elysee Cross Back Blazer with this Girl Charlee Stretch Denim . 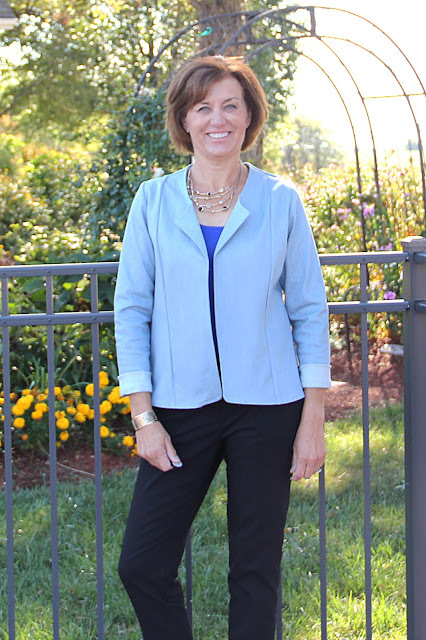 This pattern is a blazer designed with princess seams and the option of a gathered sleeve or straight sleeve. 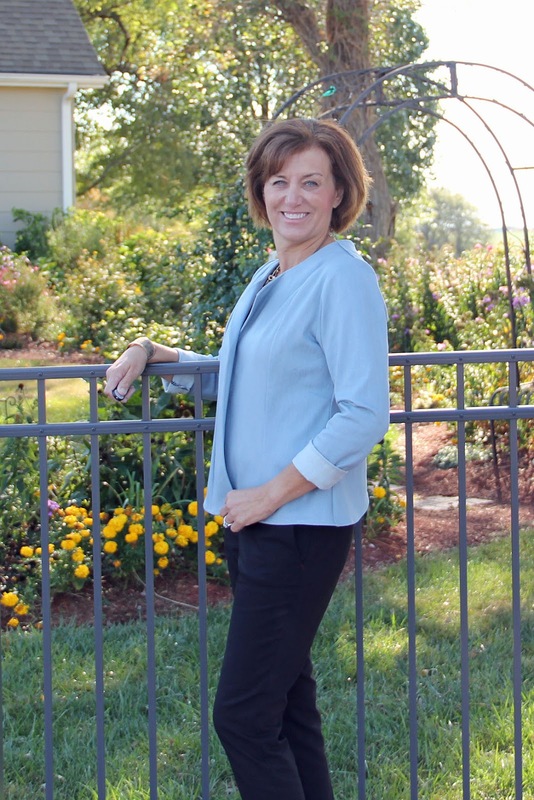 You also have the option of short, 3/4 length, or long sleeves - so it is perfect for all seasons. All of the internal seams are finished with bias tape for a professional finish that adds a great pop when the jacket is opened. 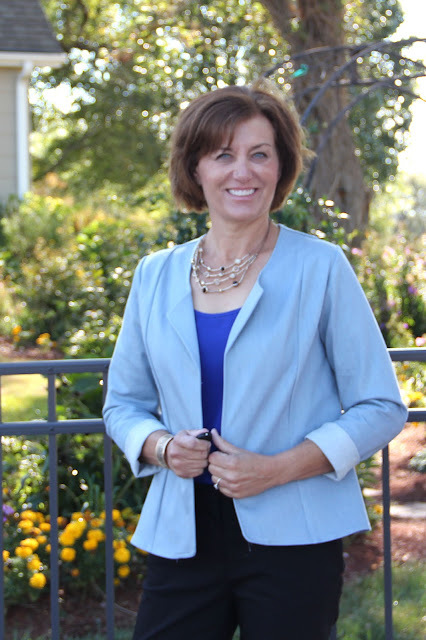 The Cross Back Blazer can dress up or down easily so that it works perfectly at the office or on the playground. The cross back allows for ease of movement and a relaxed fit yet it still has a tailored finish that will convince anyone that it came from a high end store. I really liked the look of the cross back on this blazer, such an interesting detail. Now my back is big on this jacket, but I am wearing it with a sleeveless tank. My intentions for this jacket are to wear with sweaters and layers, thus the looser fit. My sizing corresponds to the Large size, I have a 38 inch bust and hip, too. Now if you want a closer fitting jacket, size down. This is what I will do for the next jacket, wouldn't it be so cute out of this black and white tile stretch denim? Or this floral? High quality Italian imported light indigo blue slub denim fabric with a bit of spandex for good recovery and movement. Stretch is about 20% across the grain and also has a natural bias stretch of about 25%. Fabric has a small amount of tate-ochi, or slightly lighter and darker vertical lines visible in the fabric that give it a stylish, un-uniform appearance. Great for jeans, jackets, pants, and more! A very high end designer fabric. The fabric washed and dried beautifully and Girl Charlee does say the fabric might bleed due to the dying process. So please do wash the denim and I like to wash my denim twice and dry it twice. It just makes me feel better about possible shrinkage. This stretch denim would be fantastic for jeans, the amount of stretch is perfect for comfortable jeans. Plus the recovery is excellent. The Blazer instructions are very thorough and have bias binding as a seam finish. I made my own binding from some quilting batik in my stash. The fall winds were blowing a bit briskly and I had to hold the jacket fronts to keep my jacket in place. That is fine, it is so nice to have the brisk weather. A couple of changes, the pattern has you take the bias binding on the seam between the facing and the front. The binding is from the back to the hem to the front. I stopped my binding about 2" inside the facing. I also topstitched the entire blazer front and neck edge. 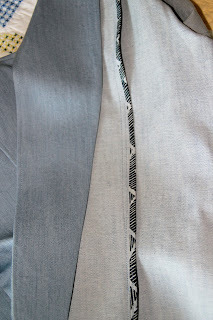 I wanted to continue the stitching of the hem around the entire jacket. 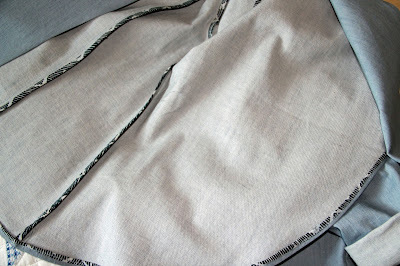 The seam allowances for this pattern are 3/8", my front princess seams and side seams are stitched at 5/8". The final alteration was to cut the length of the pattern at the largest size. Disclosure - Girl Charlee provided me with the fabric and the pdf pattern to make this garment. The opinions of construction, the pattern and the fabric are all mine. 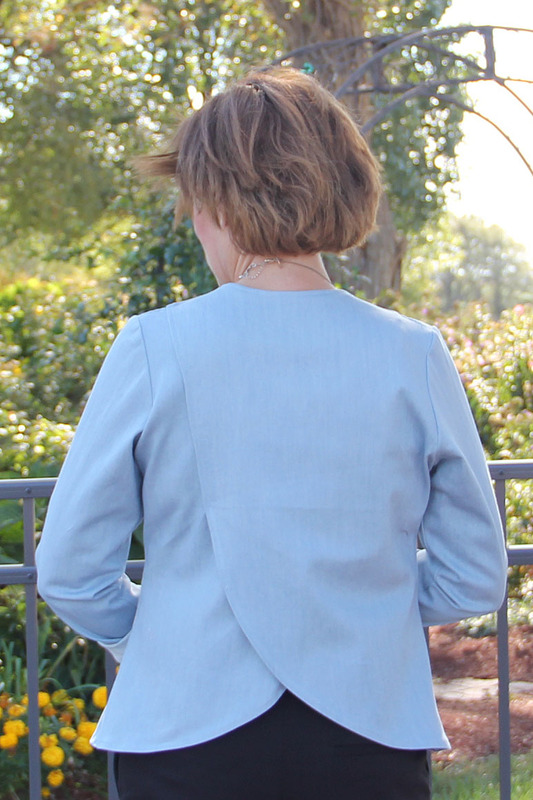 Lovely jacket, I really like the back detail! What an unusual design! It's very chic! I like this jacket. Not to fond of the gather sleeve cap and then reread that you sew a plain or gathered sleeve.